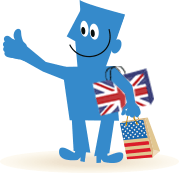 Borderlinx | Buy Playmobil and ship worldwide with Borderlinx. Cheap rates guaranteed. Playmobil Germany is a childhood classic, treasured by young and old alike, thanks to the talents of Hans Beck during the early 1970's. The little Playmobil Germany figures are tiny human models with movable parts that are designed to be part of a wide variety of fun scenarios that stimulate imagination and play. Produced by Germany's largest toy manufacturer, the Brandst?tter Group, Playmobil Germany playsets have been bringing joy to children for more than four decades. Playmobil Germany promotes child development through play with adherence to all safety measures. Playmobil Germany toys are designed for toddlers and children ranging in age from one and a half to 12 years. Choose from an extensive selection of affordably priced fun, whimsical, or realistic playsets. From pirate battleships and spaceships or unicorn and fairy worlds to firetrucks, tractors and castles, the choices are seemingly endless. And when you purchase from Playmobil Germany, you can do so secure in the knowledge that their toys are manufactured with consideration and care for the environment and energy conservation. With Borderlinx, you can buy Playmobil Germany and ship around the world. See how much it will cost with our shipping cost calculator. Other Borderlinx benefits include concierge service, and purchase consolidation. Check out how Borderlinx works and how easy it is to open your account for free. A number of services are available through Borderlinx to make international ordering from Playmobil Germany hassle-free, including shipment value protection, free repacking and consolidation services.